Read Ron Deibert’s op-ed in the Globe and Mail. Read our primer on mobile privacy and security. Read the Summary: Privacy and security issues with UC Browser. Read the Summary in Chinese: 啰嗦的松鼠：UC浏览器的隐私与安全问题. A follow-up to this report with further analysis of UC Browser is available here: A Tough Nut to Crack: A Further Look at Privacy and Security Issues in UC Browser. UC Browser is the most popular mobile web browser in China and India, boasting over 500 million users. This report provides a detailed analysis of how UC Browser manages and transmits user data, particularly private data, during its operation. Our research was prompted by revelations in a document leaked by Edward Snowden on which the Canadian Broadcasting Corporation (CBC) was preparing a story. The CBC contacted us requesting our comment. The document, apparently prepared in 2012 by Canada’s signals intelligence agency, the Communications Security Establishment (CSE), noted the existence of security vulnerabilities in UC Browser. Given the Citizen Lab’s ongoing research into popular Asian communications tools, and the possibility of vulnerabilities affecting a large number of users, we decided to conduct an independent investigation of UC Browser. While media outlets are publishing a story about the CSE document, we cannot determine if the problems we identify in UC Browser and that are described in this report are identical to those referenced in the 2012 CSE document. User data, including IMSI, IMEI, Android ID, and Wi-Fi MAC address are sent without encryption to Umeng, an Alibaba analytics tool, in the Chinese language version. User geolocation data, including longitude/latitude and street name, are transmitted without encryption by AMAP, an Alibaba mapping tool, in the Chinese language version. User search queries are sent without encryption to the search engine Shenma (in the Chinese language version) or Yahoo! India and Google (in the English language version). Reason for concern: The transmission of personally identifiable information, geolocation data and search queries without encryption represents a privacy risk for users because it allows anyone with access to the data traffic to identify users and their devices, and collect their private search data. 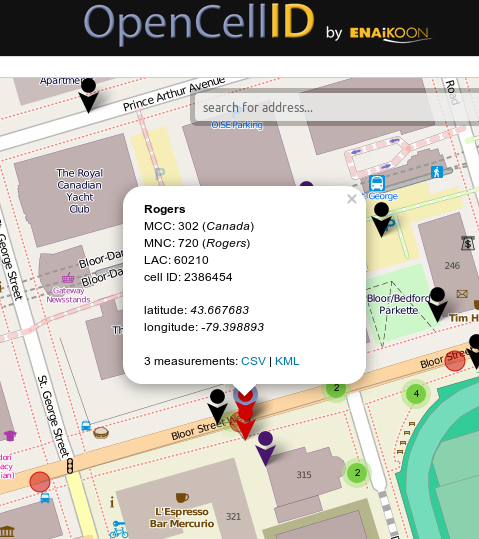 Location and user data, including IMSI, IMEI, and data about nearby cellular towers and Wi-Fi access points, are sent with easily circumvented encryption by AMAP, an Alibaba mapping tool, in the Chinese language version. Reason for Concern: UC Browser’s transmission of personally identifiable subscriber data, mobile device identifiers, and user geolocation data without effective encryption presents a security and privacy risk for users. In the Chinese language version, when users attempt to delete their private data by clearing the application’s cache their DNS lookups are not deleted. Reason for concern: The cached record of DNS lookup data would allow for a third party with access to the device to identify the websites that a user visited. This report is a continuation of our prior work examining the security and privacy of popular mobile applications in Asia. Our previous research includes investigations of censorship practices of search engines offered by Google, Microsoft, and Yahoo! in the Chinese market along with domestic Chinese search engine Baidu. In addition, we have analyzed keyword censorship and surveillance in TOM-Skype (the Chinese version of Skype at the time) and keyword censorship in Sina UC, another Chinese instant messaging platform. We are currently conducting comparative analysis of mobile chat applications used in Asia including WeChat, LINE, and KakaoTalk. 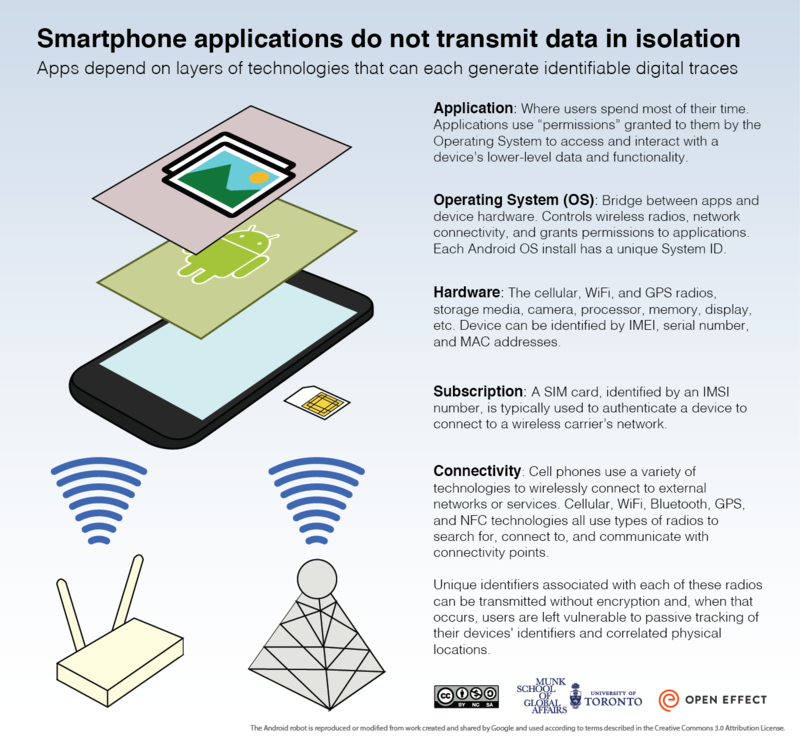 Figure 1: Overview of mobile device data transmission. We disclosed our findings to Alibaba and UCWeb on April 15, 2015, and informed them that we would publish this report on or after April 29, 2015. Alibaba responded to our notification on April 19, 2015, indicating that their security engineers were investigating the issue. We followed up on April 23, 2015 to reiterate our intention to publish this report on or after April 29, 2015. As of May 19, 2015 we have not received further communication from Alibaba or UCWeb. On May 19, 2015 we tested version 10.4.1-576 of the Chinese language version of UC Browser, which was downloaded from the uc.cn website. This version does not appear to send location data insecurely to AMAP as described in this report. However, the issues we describe in this report relating to insecure data transmission to the Umeng component, as well the lack of encryption on search queries, remain in this version. Users who use the Chinese version of UC Browser should upgrade the application and ensure they are running version 10.4.1-576 or above. UC Browser is a mobile web browser for Android, IOS, Windows Phone, and other platforms. A Windows version was released in April 2015. The application is the flagship product of UCWeb Inc., a Guangzhou, China-based company founded in 2004. After an initial investment by e-commerce giant Alibaba, the two companies launched the joint mobile search service Shenma. Shenma reportedly has more than 100 million users per month. In June 2014, Alibaba purchased the remaining stake in UCWeb in the biggest ever merger of Chinese Internet firms. UC Browser is among the most popular mobile apps in the Chinese Internet space. UC Browser claims to have more than 500 million registered users, and is reported to be the most popular mobile browser in China and India. Overall, the application is the fourth most popular mobile browser globally, and is behind only pre-installed Chrome, Android, and Safari browsers. UCWeb Inc. claims the app has 100 million daily active users, while parent company Alibaba’s 2014 prospectus reported the number of active users at 264 million in June 2014. UC Browser was ranked as the second most popular app by usage in China in January 2013. The company has also increased its global push, and claims it has at least 10 percent market share in 10 different countries. UC Browser offers a custom default homepage with links to search engines and social media integration, as well as news, weather, and shopping services. A set of features are aimed at reducing bandwidth usage on mobile clients. “Cloud download,” for example, allows users to send downloads directly to UDisk (a UC cloud offering) in order to save on bandwidth costs. In addition to this feature, UC Browser can act as an optional proxy and compress web sites it fetches to reduce bandwidth consumption. This section describes the methods we used to analyze UC Browser, and presents detailed findings from our analysis. We isolated specific versions of the Chinese- and English-language builds of UC Browser for Android and analyzed their mobile (cellular network) data and Wi-Fi traffic. We also analyzed the application’s data retention and deletion practices. Our analyses revealed major privacy and security issues with all of the tested versions of UC Browser. Figure 2 highlights the major findings for the Chinese language version of UC Browser. Figure 2: A visual summary of privacy and security issues presented by UC Browser. We isolated specific versions of the Chinese- and English-language builds in order to examine UC Browser’s security and privacy features. Specifically, we monitored the data that was transmitted between the application and external servers. We were specifically interested in what, if any, personally identifiable information was transmitted by UC Browser, and whether encryption was used to secure those transmissions. We analyzed the state of the application, both in-idle state (soon after the app was opened) as well as during use of the app’s features, such as searching. Lastly, we examined the data UC Browser stored on the device, and whether that data was protected with encryption. Tests were conducted within an Android emulator and on an Android handset. All traffic sent to and from the device was collected and analyzed using the packet-capture utility WireShark. We decompiled the downloaded APKS with APKtool and then analyzed the code for functionality related to the transmission of user data. We analyzed two versions of UC Browser for Android. We downloaded the two versions from different app stores: the Chinese-language version of UC Browser (UC浏览器) was downloaded in March 2015 from the Xiaomi mobile app store. Henceforth we will refer to this app as UC Browser (Chinese) to distinguish between versions. We downloaded the English version, henceforth UC Browser (English), in April 2015 from the UCWeb website. These two versions have differences beyond language: by default, the Chinese version uses Shenma (sm.cn) for search, while the English version uses Yahoo! India and Google; the Chinese version has links to China-based services such as Baidu, Sina Weibo, and Youku, while the English version uses services such as Google, Facebook, and Twitter. Figure 3: Side-by-side comparison of UC Browser (Chinese) and UC Browser (English). 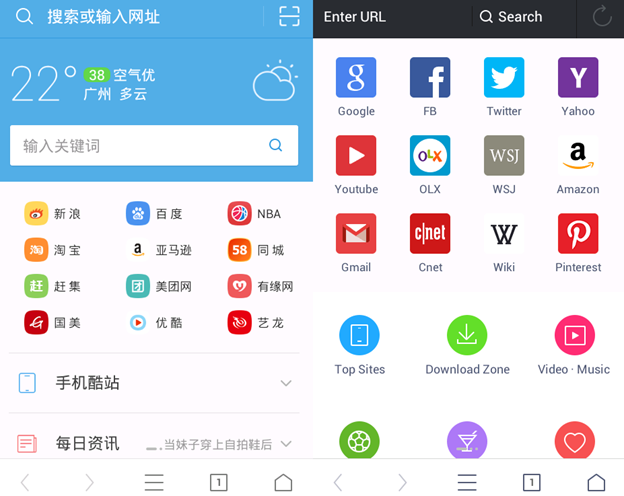 Figure 4: Side-by-side comparison of permissions requested during installation of UC Browser (Chinese) (left) and UC Browser (English) (right) versions of UC Browser. 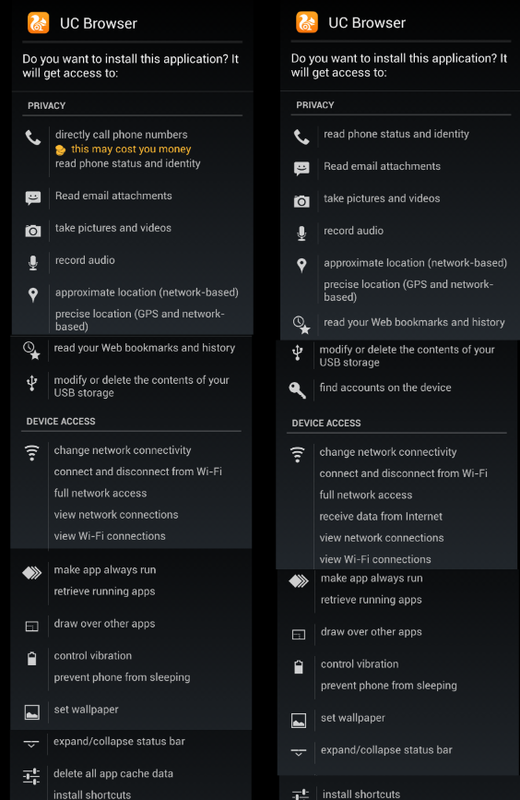 Figure 4 shows the permissions that the Chinese and English versions of UC Browser requires when being installed on an Android device. For the purposes of this report, it is notable that the application requests access to phone status and identity, geolocation information, the ability to read Web bookmarks and history, as well as to extensive networking information. As discussed further in the report, UC Browser (Chinese) accesses phone identity and geolocation information and transmits it insecurely. Table 2: Summary of test results for UC Browser (Chinese). The AMAP component of UC Browser (Chinese) contacts apilocate.amap.com, and sends user and device identifiers (IMSI, IMEI) and location data (cell tower data) with easily circumvented encryption. The Umeng component of UC Browser (Chinese) sends device identifiers (including IMSI, IMEI, Android ID) without encryption. The AMAP component sends, with easily circumvented encryption, the same data as noted in the row above (“Cell only” mode). In addition, it sends device Wi-Fi MAC address, SSID, and MAC address of the Wi-Fi access point to which the user is connected, and nearby wireless access points. The Umeng component sends the same device identifiers as noted in the row above (“Cell only” mode), with the addition of the device Wi-Fi MAC address, without encryption. Search queries using the search bar are sent to Alibaba’s Shenma search engine without encryption. 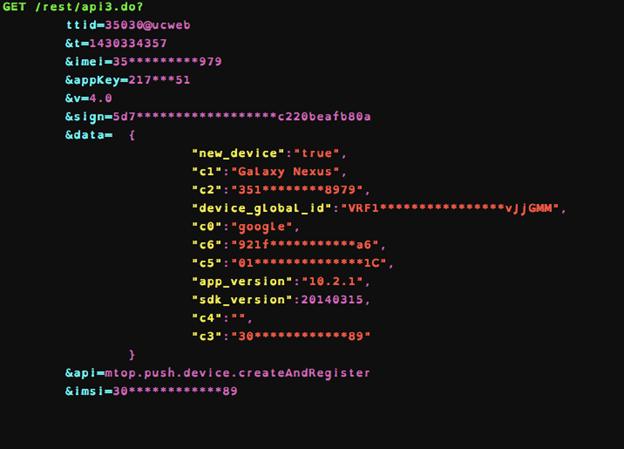 After clearing the application’s private data, the cached record of DNS lookup data remains. In our first test, we launched the application, let UC Browser (Chinese) idle for 270 seconds, and collected all network traffic sent to and from the device. We then analyzed that traffic to determine what data was being sent and its destination. We performed the test first by connecting the mobile device to the Internet using a cellular connection, and, second, by connecting the device to the Internet using a Wi-Fi network. As seen in Figure 5, the majority of communications (57% of HTTP packets in our 270 second sample) are between the application and apilocate.amap.com. AMAP is a mobile mapping application that was originally developed by Autonavi, a company acquired by Alibaba in April 2014. AMAP is estimated to have more than 100 million users. Figure 6: Sample communication between UC Browser (Chinese) and apilocate.amap.com. 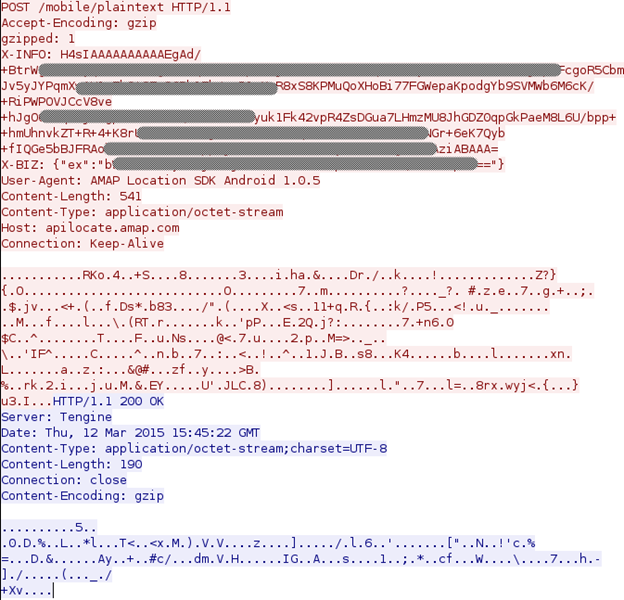 The user-agent string indicates this communication is from “AMAP Location SDK Android 1.0.5.” We have redacted personally identifiable data. Figure 7: Deciphered communication between UC Browser (Chinese) and apilocate.amap.com. Personally identifiable data redacted with asterisks. 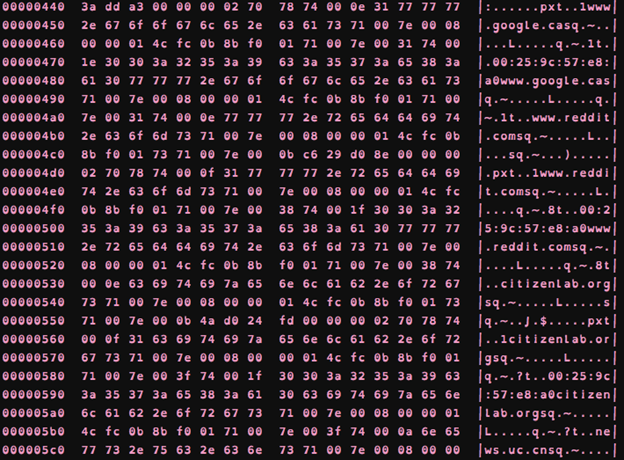 The encoded data sent within the ‘<sreq>’ structure intrigued us because it was a relatively large block of data. Its size suggested that it might contain user data. To confirm if user data was present we first analyzed how the data was encrypted. 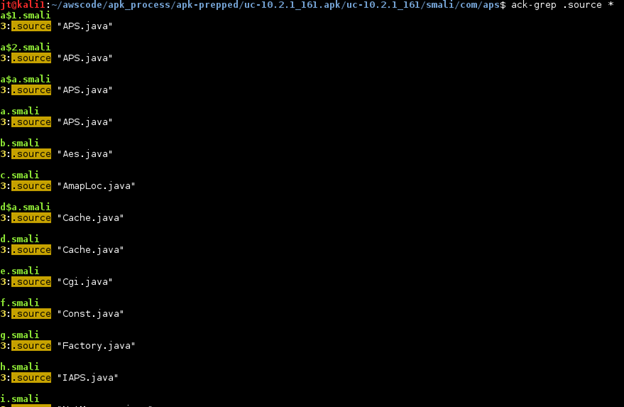 Using apktool we decompiled UC Browser (Chinese) to see how the application created and serialized the ‘<sreq>’ structure. After decompiling, we looked for the string ‘sreq’ in the outputted code and found this in a directory associated with the com/aps class (Android programs often incorporate a mix of components, called classes, sometimes from different developers). 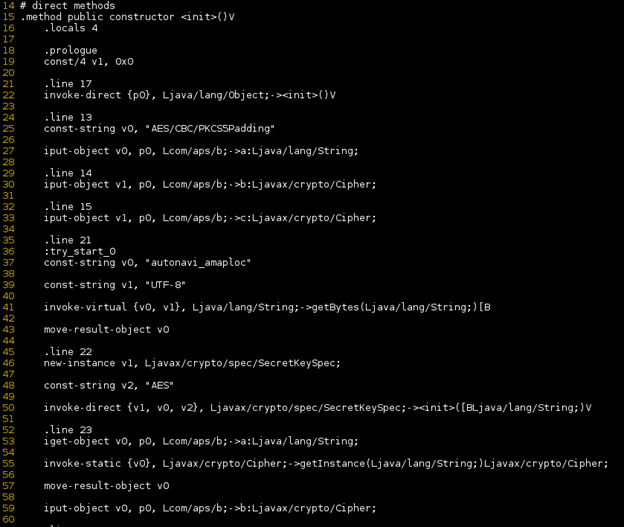 Figure 8: Mapping of smali files in com/aps directory to java source code. Figure 9: Aes.java smali code showing AES/CBC encryption with a hard-coded key. The use of symmetric encryption with a hard-coded key means that anyone who knows the key can decrypt UC Browser (Chinese) traffic in transit. Moreover, key holders can also retroactively decrypt any historical data that they have collected or obtained. Figure 10: Decrypted data sent via AMAP service. Personally identifiable data redacted with asterisks. 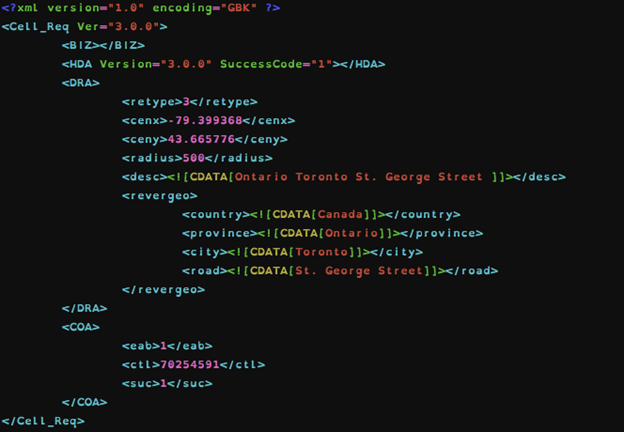 The data sent to apilocate.amap.com included a number of unique identifiers. The first set referred to the mobile device itself: the IMSI, IMEI, and unique user data related to this installation of UC Browser (Chinese). The second set referred to details of the cell tower to which the device is connected: the Mobile Country Code (MCC), Mobile Network Code (MNC), Location Area Code (LAC), Cell Tower ID, and the cell tower signal strength. In aggregate, these sets of information can be used to identify the cellular subscriber, the physical handset, and the physical location of the device. Figure 11: Unencrypted response received by UC Browser (Chinese). Figure 12: Example of location identified from MCC, MNC, LAC, and CellID. In summary, we strongly suspect that AMAP is the component of UC Browser (Chinese) that is responsible for transmitting the geolocation information. Our belief is based on the fact that the user-agent string (“AMAP Location SDK Android 1.0.5”), the location where the data is sent (apilocate.amap.com), and the text of the hard-coded key (‘‘autonavi_amaploc”) all reference AMAP. Given the apparent integration between AMAP and UCWeb we believe that it is likely that AMAP was incorporated into UC Browser (Chinese) to provide mapping and geolocation functionality. 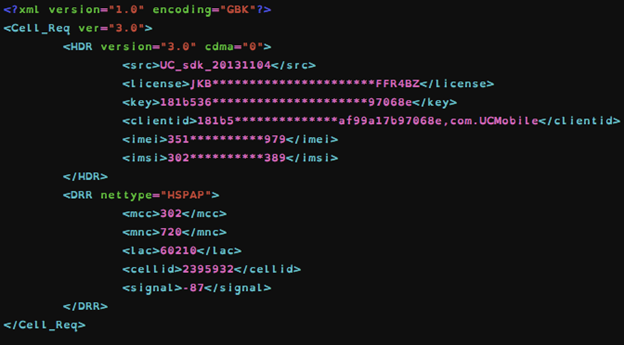 Figure 13: GET request made to utop.umeng.cloud with a cellular Internet connection showing that application sends IMSI, IMEI, Android ID, and build serial number without encryption. Personally identifiable data redacted with asterisks. A number of unique personal identifiers are included in this data structure. 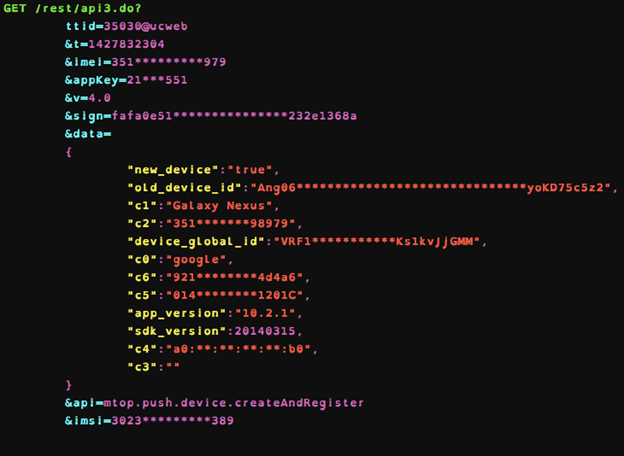 This included the IMEI, IMSI, device Android ID (‘c6’), and the build serial number (‘c5’). Like AMAP, we believe it is likely that Umeng was incorporated into UC Browser (Chinese) to provide in-app analytics. 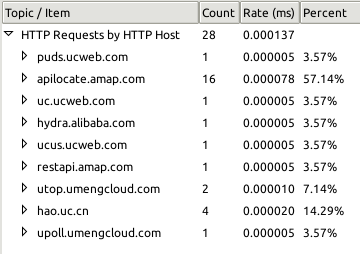 Figure 14: Data sent by UC Browser (Chinese) to AMAP when Wi-Fi is enabled. Personally identifiable data redacted with asterisks. Figure 15: Traffic sent to utop.umengcloud.com during idle. Personally identifiable data redacted. Figure 16: GET request made to utop.umengcloud.com with Wi-Fi enabled showing that IMSI, IMEI, Android ID, and device Wi-Fi MAC address are sent unencrypted. Personally identifiable data redacted with asterisks. In summary, when connected to a Wi-Fi network, the IMSI, IMEI, Android ID, and Wi-Fi MAC address are sent unencrypted by UC Browser (Chinese) to umengcloud.com. Figure 17: Search for “cntower” using Shenma mobile search engine via UC Browser (Chinese) search bar. Figure 18: DNS records found in cache after private information was deleted. This DNS data was stored in the cache as a serialized LinkedHashMap, and persisted even after all other data in the cache had been cleared using the application’s feature to clear private browsing data. 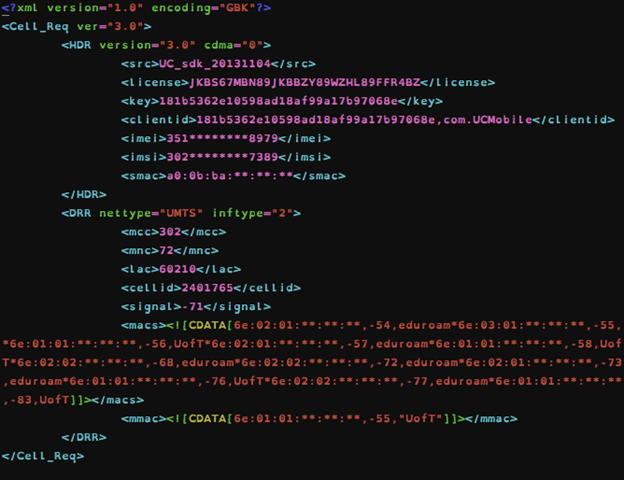 There was sufficient plaintext remaining that the records could be read using a simple text editor. In other words, even if a user attempts to clear browsing records their personal data remains available for scrutiny and can be trivially accessed. Table 3: Summary of test results for UC Browser (English). We performed the same idle test described previously with the English language version: the application was launched, left idle for 270 seconds, and all traffic sent to and from the device was collected. We first performed the test by connecting the mobile device to the Internet using a cellular connection and, second, by connecting the device to the Internet using a Wi-Fi network. Our analysis showed that UC Browser (English) did not send and receive traffic through the AMAP or Umeng component as in the Chinese language version. We were not able to identify any easily decrypted traffic sent in the English language version. Figure 19: Screenshot of search features of UC Browser (English). Both the “Enter URL” and “Search” fields can be used to perform a web search. Figure 20: Packet capture of search for ‘toronto bluejays’ (highlighted in blue) performed using search bar in UC Browser (English). Search query is sent unencrypted to Yahoo! India. Figure 21: Search results for an unencrypted search to Yahoo! India with a green checkmark. The use of this green checkmark could lead to some confusion with users, as most web browsers use a green icon to the left of the search bar to reflect an encrypted connection. UC Browser (English) displays a green padlock to the left of the browser bar if the HTTPS-encrypted version of a site is opened manually in a browser. Figure 22: Packet capture of search for “go jays” (highlighted in blue) performed using the address bar of UC Browser (English). In summary, both methods of performing a search in UC Browser (English) sent the search query unencrypted to either Yahoo! India or Google. The standard web version of each of these search engines uses HTTPS encryption by default. 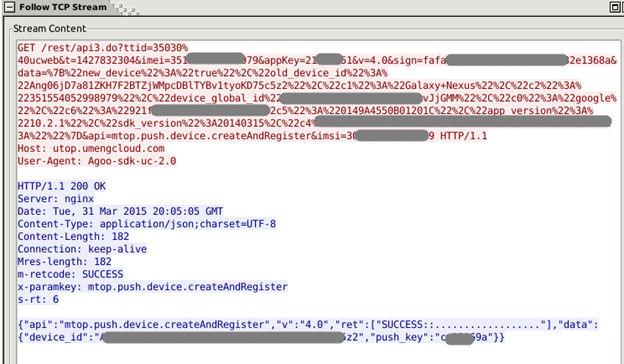 Finally, we analyzed how UC Browser (English) stored personal user data on the device. The English language version, unlike the Chinese language version, did not store DNS lookup data as part of the private browsing data. Further, using the option within the application to delete private browsing data did delete all such data. Our analysis shows that both versions of UC Browser leak information to third parties, but that privacy and security concerns for the Chinese language UC Browser are much greater. The Chinese UC Browser version we tested (“UC Browser (Chinese)” in this report) leaks a significant amount of personally identifiable information, raising major security and privacy concerns. The leakage of the IMSI, IMEI, and geolocational information can identify a cellular subscriber, the device that they are using, and their specific location. As a result of the weak encryption used by UC Browser, any party with access to the data traffic — either real-time or historical — can link specific devices to specific places at specific times. And if the decrypting party has a large volume of data they can track subscribers vis-a-vis their mobile devices as they move around the world. In many political jurisdictions (including China and India) it is common for authorities to require telecommunications companies, cellular providers, and Internet cafes to share the data they collect with security agencies as a condition of obtaining an operating license. By leaking a large volume of fine-grained data points to multiple network operators, the UC Browser app is increasing the risks to its users that such data may be used against them by authorities, criminals, or other third parties. The data leakages we outline are particularly problematic for individuals who use their devices to engage in sensitive communications or for whom disclosing their physical location could place them at increased risk. Similarly, individuals concerned with protecting sensitive activities related to their work while traveling or communicating should be concerned about the potential for industrial espionage. While we concluded that UC Browser (English) leaks considerably less identifying information, users might be surprised to realize that, despite the presence of an icon suggesting security in one of the search bars, their search terms are transmitted without encryption to Google and Yahoo! India servers. Ultimately, the concerns identified here with respect to UC Browser demonstrate the larger challenges of ensuring user security and privacy within the burgeoning market for mobile applications. The mobile ecosystem is complex and multi-layered, involving large volumes of personally identifiable information that are transmitted across networks, devices, operating systems, and applications owned and operated by numerous private companies across many political and regulatory jurisdictions. Such a complex system underscores the importance of systematically evaluating the privacy and security of mobile communications as they become integral to the everyday lives of individuals and communities worldwide. Would Encryption Solve UC Browser’s Problems? We have highlighted the lack of encryption for personally identifiable data as a key reason for concern over UC Browser. Encrypting data that is this sensitive certainly represents an industry best practice, and it is unclear why only the English version seems to implement encryption consistently. Modifying the Chinese version to match the encryption used in its English counterpart could be an important step in increasing user security, as would encrypting queries to Google and Yahoo! India in the English version. However, even if all data were strongly encrypted, this step would simply simply make it more difficult for unauthorized parties to read the contents of data transmissions. Encrypting sensitive user data can limit the number of actors who can access the data but does not prevent the inappropriate collection, retention, and analysis of the data by application developers and their commercial partners. Put bluntly: increases in transport security do not necessarily improve corporate data handling practices. The core advantage of better encrypting data traffic is to engage, and hopefully make more transparent, the processes that government agencies and other third parties must engage in to access information that is collected, retained, and processed by application developers. In many jurisdictions, authorities will first have to obtain a court order before lawfully accessing the application developers’ data. Nevertheless, when data is held in jurisdictions where this process is not enshrined, or where there are strong incentives to share the data, encryption alone does not solve the problem. This project was supported by the John D. and Catherine T. MacArthur Foundation. CBC News, The Intercept, Reuters, Wall Street Journal, SC Magazine, VICE, The Hacker News, Tech Times, The Straits Times, PC World, The Register, Hindustan Times.